Next meeting: 8.00pm, Thursday 26 July, 48 Stafford Road. If you would like to attend, please contact the Hon Sec, Jannet King, in advance on 509653. Either return in envelope or complete online. Deadline: 5pm, Monday 16th July. The Exeter Street Hall survey is an essential component in our plan to provide a truly inclusive space for the Prestonville community. You can return the questionnaire in the envelope provided, or, complete it online. It should take no more than 10 minutes. By completing the questionnaire, you will help us to find out how the hall is currently used and how it should be used in the future. The hall with cleaned up walls, a new floor and all storage removed. Over recent months, TheHallGetInvolved’s building team has started to look at the interior design on the hall. 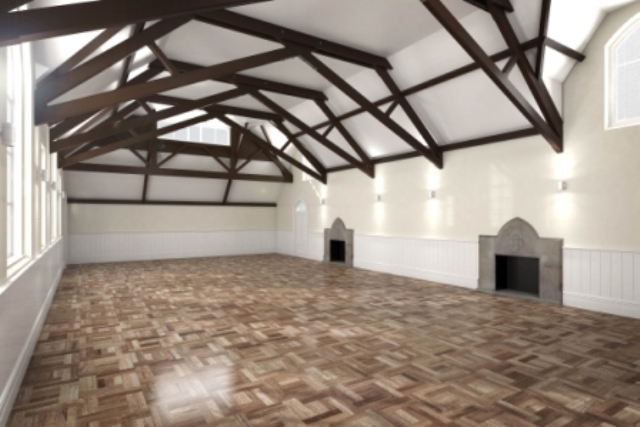 The aim is to make the hall space as flexible as possible, so that we can cater for a wide range of activities. The image above is the first produced by Gareth Wellock, a Prestonville resident who specialises is producing 3D visualisations. Gareth has joined the building team to help convert ideas into realistic visions of the hall as it could look. It’s important to remember that these designs are simply ideas at this stage. We will need to speak to all groups who currently use the hall to assess the impact of any suggested changes. What else is the building team doing? As many of you will know, the hall is in a poor state and needs some major refurbishment. The roof needs replacing and the heating system overhauled. In fact there’s not much that we can leave alone if we want to upgrade the hall and make it fit for purpose for another 100 years. This has given us an opportunity to think radically about environmentally friendly solutions whilst bearing in mind that we have to be realistic. We’ve had talks with renewable energy consultants EnergyMyWay and and some valuable advice from Oliver Heath who came along to look at the hall in June. Along with draught proofing and insulation, we are also looking at a range of options for renewable, low carbon and carbon neutral heating. Harvesting rain water from the roof and using it to flush the toilets is being looked into and could be installed at the same time as a replacement roof. There is a huge amount of work to do here. Although decisions are a long way off, we are all committed to making the hall a place that the community can be proud of. Or next round of designs will follow the survey which went out to all homes in the Prestonville area this week. Have you returned yours? An online version of the survey is available.